Click the map to view larger. For those arriving to the area via New York City terminals such as JFK, LaGuardia or Newark airports, Penn Station, or Port Authority Bus Terminal, please contact Amtrak or Trailways buses for connections from NYC to Albany and/or Cobleskill. It is also possible to rent a car and follow the driving directions to the campus. Travel time from the New York City area is about 3.5 to 4 hours by car or bus, and about 2.5 hours by train to Albany-Rensselaer. 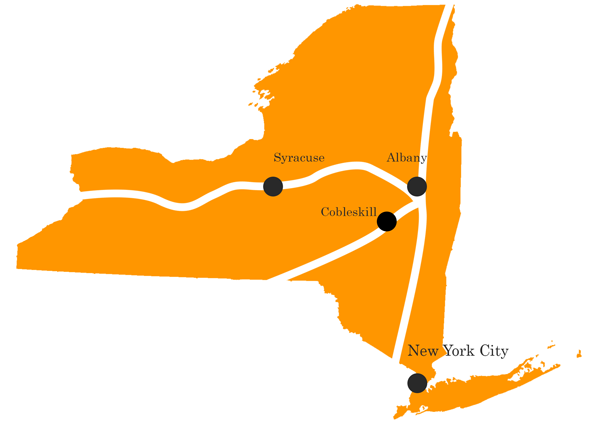 Trailways buses also have connections between Albany and Cobleskill.